A unresponsive private plane crashed in Jamaica on Friday, causing a brief scare around the northern Caribbean and the United States. The plane originated in Rochester, New York and was bound for Naples, Fla. until it became unresponsive about an hour after takeoff. 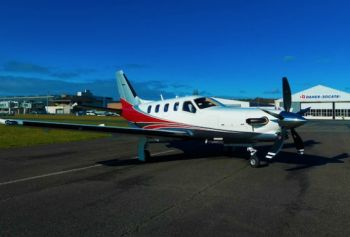 Eventually, the Socata TBM plane went off course, first entering Cuban airspace and eventually crashing 14 miles off the coast of Port Antonio, Jamaica. According to reports, the plane was piloted by an Upstate New York real estate developer named Larry Glazer, who died in the crash along with his wife, Jane. Marie Harf, a US State Department deputy spokesperson, said as of 11:30AM Friday morning, two F-16 fighter jets under the direction of NORAD were sent to investigate the unresponsive aircraft. The jets then handed off monitoring duties to two F-15 fighters from Homestead Air Reserve Base in Florida, which escorted the aircraft until it entered Cuban airspace. “At this time, they broke off with the possibility of reconnecting with the aircraft over international waters south of the island,” NORAD said. In a statement, NORAD said the two jets then had to return to base due to “fuel considerations.” It was during this time that the plane crashed. The United States Coast Guard ha initiated a search and rescue effort in the region. Reports pointed to a loss of cabin pressure as the likely culprit. Harf said the US government been in contact with both Bahamian and Cuban officials as the incident unfolded. I didn't read anything about the crashed plane running out of fuel. "Loss of cabin pressure was the likely culprit". The two F-15 fighter jets who were investigating the unresponsive aircraft returned to their base due to fuel considerations. If that was ur mom & dad would u have been saying thanks god it ran out of gas? How do they know that is was lost of cabin pressure when aircraft was unresponsive......and no investigation was yet conducted.